An Alien View of Human History is available on Amazon! 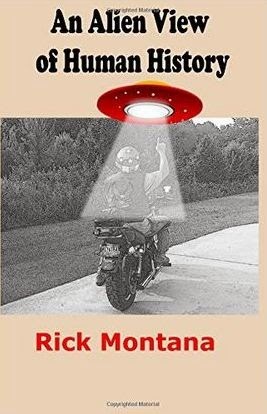 A UFO swoops down and abducts Rick Montana, motorcycle and all. The aliens give him a series of lectures on their interaction with humans through time. He learns the aliens have been conducting experiments on the inhabitants of Earth and several other planets. They pick life forms and manipulate their brains from time to time and then wait a few years to judge the results. It is time to make a decision about whether the aliens destroy mankind and start over or give us more time to develop into a worthy species. After hearing the aliens describe the mess humans have made over the years, it doesn't look good for the home team. While this is a work of science fiction, it is filled with "alien observations" that are factual representations of human history. Some observations you will agree with and laugh at. Some will make you angry because you never looked at history that way. The purpose of this book is to entertain, inform, and to make you think. Think about the unintended consequences of many of the things humans have done that began with good intentions. Instead of knee jerk reactions to events, take a look down the road at what your well intentioned actions may cause. Excerpt of Review by Genni A. “The author uses the aliens to present a unique look at a series of events throughout human history that most of us never really think about. His factual observations on religion, political correctness, and the unintended consequences of various well intentioned programs definitely made me think.